These questions may not apply to every situation you come across, but they are a good starting point. They are in addition to our general questions to ask in any clinical situation. Which medicine(s) is the breastfeeding mother taking? Could the medicine be stopped, or a non-drug option chosen instead? In any clinical situation it's appropriate to discontinue a medicine if, for example, it's no longer needed or not working. 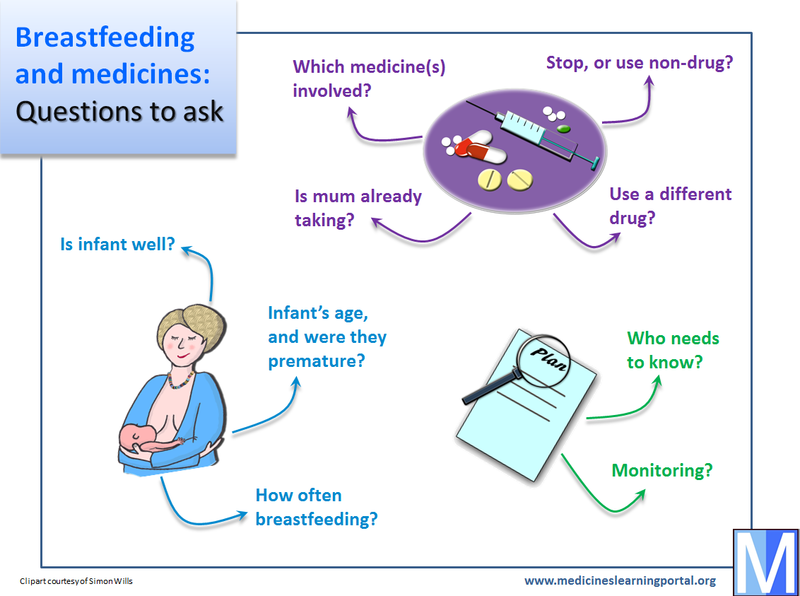 What different medicines might be suitable if the current medicine is a less satisfactory choice in breastfeeding? It's useful to know if any alternatives are under consideration or might be the prescriber's next choice. Similarly, a different medicine might have already been tried unsuccessfully and you need to know this. Has mum already been taking the medicine? Find out if the infant has already been exposed to the medicine in pregnancy or breastfeeding, and whether any potential problems have been identified such as side effects or withdrawal symptoms. Is the infant well? Is there anything to suggest that the infant may be at increased risk of drug harm (e.g. kidney or liver dysfunction)? How old is the infant, and is he/she premature or full-term? This might affect clearance and susceptibility to side effects. How often is the baby being fed, and are they relying exclusively on breast milk? This determines the extent of drug exposure via breast milk. Who else needs to know about the advice you give? For example, you might need to know who can amend the patient's therapy if necessary, counsel the patient, or document your advice in the patient’s notes. If any monitoring of mother or baby is required during breastfeeding, who will do this?